Happy Monday! I don't know about you, but this has been a long Monday for me. I started out with 3.16 miles outside in the neighborhood. That got me a little over 7,000 steps toward my new 13,000 daily step goal. A long walk followed by a nice big fruit bowl for breakfast. That's what I call a good start to the day. 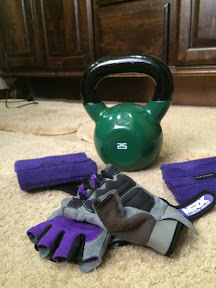 After a busy day at work, I had to end the day with a sweaty kettlebell workout. 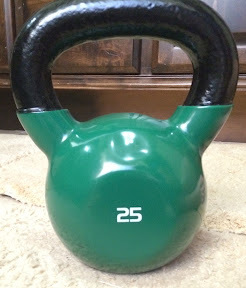 Tonight, I used a 25 pound kettlebell and it is no joke. I'm not gonna lie - when I use this thing, my arms and legs just shake and I sweat so much. My shirt is soaked through. My arms just feel dead. AND I LOVE IT! Anybody with me on this? Yes, I like to do my kettlebell workouts in my bathroom. Kinda crazy? I'm a mom - it's one of the few places I can get any privacy! See the picture below? 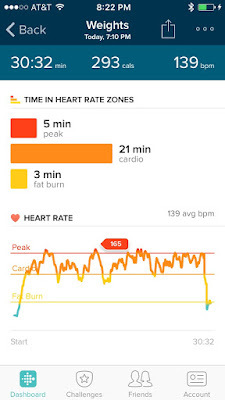 This is the heart rate monitor on my Fitbit Flex during my kettlebell workout today. The kettlebell is NO JOKE. It's hard work. This was my workout tonight. 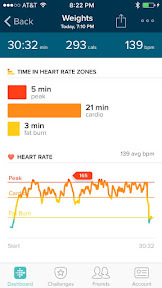 Then I did a bit of ab work - 20 rolling kettlebell situps, 15 kettlebell situps, 20 rolling kettlebell situps. I'd never done the Kettlebell High Pull before. I will probably be feeling that workout tomorrow. My shoulder is already feeling it. Yikes. I better go get my foam roller and pray for the best.